This intelligent and exciting WWII tale, masterfully helmed by Lean (at the start of his "epic" period), features a splendid performance from Guinness as Col. Nicholson, a British officer who has surrendered with his regiment to the Japanese in Burma in 1943. 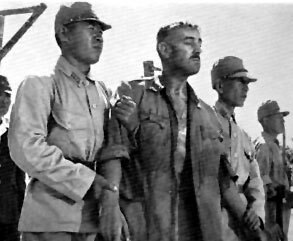 Martinet Nicholson insists that his men conduct themselves by the book and flatly refuses to cooperate with the equally dutiful Japanese commander, Col. Saito (Hayakawa, in an equally marvelous performance). 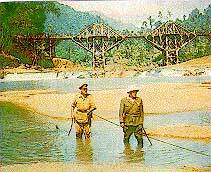 When Saito insists that the British prisoners construct an elaborate bridge over the gorge of the River Kwai, Nicholson refuses to permit his officers to work side-by-side with the enlisted men, citing the Geneva Convention. After a series of incidents including torture and negotiations, Nicholson suddenly becomes determined to build the best bridge possible, thereby restoring his men's morale and providing a shining example of British rectitude. Meanwhile, Shears (Holden), an American, escapes from the prison camp and makes his way to Australia, where he impersonates an officer to obtain the privileges of rank. 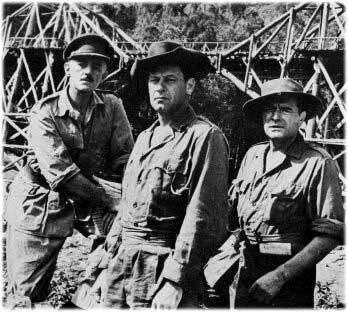 Major Warden (Hawkins), the British officer in charge of guerrilla operations, uncovers Shears' duplicity and sends him back to the jungle prison to destroy the bridge Nicholson and his men are so frantically attempting to complete. Lean aptly juxtaposes action sequences with a psychological examination of the folly of war, emphasizing its many ironies (brought home most forcefully at the explosive finale). Screenwriters Carl Foreman and Michael Wilson retained Pierre Boulle's terse, tough dialogue, which finds its greatest expression in Holden's cowardly wise-guy character. Foreman and Wilson were denied credit on the film due to blacklisting problems; in 1996, the Writer's Guild of America officially restored their names. Based on fact, the film stands as one of the finest war films ever. Stunningly photographed and featuring a theme guaranteed to keep you whistling, THE BRIDGE ON THE RIVER KWAI won seven Oscars, including Best Picture, Actor (Guinness), and Director, as well as awards for writing, editing, cinematography, and music.